Dimensions: 32mm. diameter, Thickness 11mm. 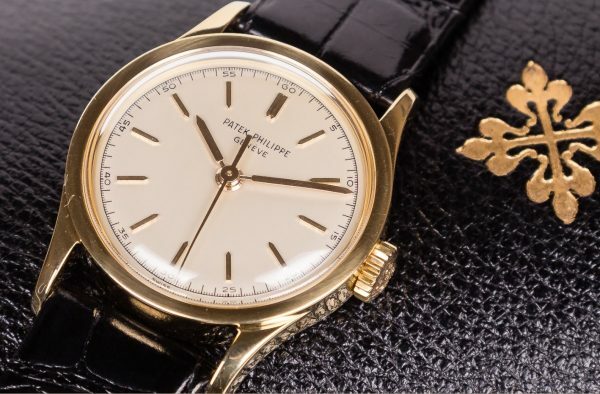 Accessories: Accompanied by Patek Philippe Extract from the Archives confirming production of the present watch in 1965 and its subsequent sale on 3rd May 1966., rare fitted presentation Patek Philippe box and additional Atelier Tempus certificate and 1 year warranty. Collectors set. Patek Philippe Calatrava Center-Seconds, waterproof ref. 2555 Yellow Gold. Very fine, center-seconds, water-resistant, 18K yellow gold wristwatch with an 18K yellow gold Patek Philippe buckle. 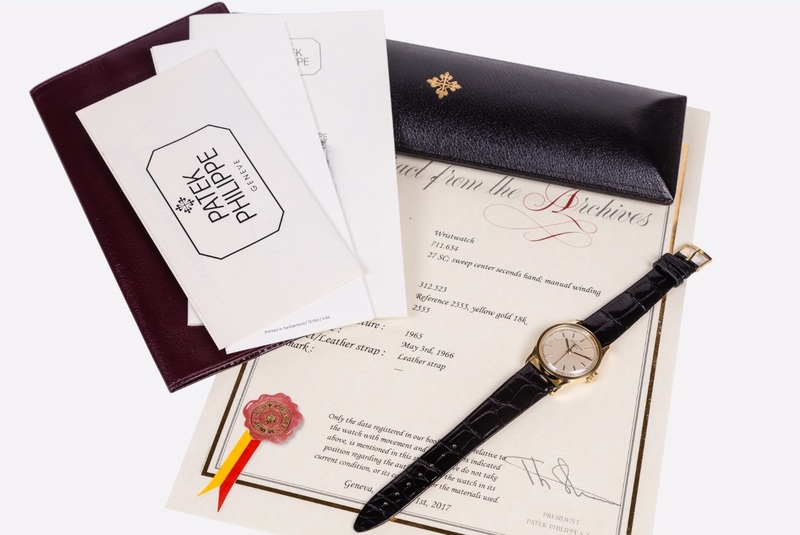 Accompanied by Patek Philippe Extract from the Archives confirming production of the present watch in 1965 and its subsequent sale on 3rd May 1966., rare fitted presentation Patek Philippe box and additional Atelier Tempus certificate and 1 year warranty. Collectors set. Case: Two-body, solid, polished and brushed, screwed-down case back, flat bezel, concave lugs. Dial: Matte silvered with applied yellow gold baton indexes and outer dots for minutes/seconds divisions. Yellow gold baton hands. Very nice indelebile. Movement: 27 SC, stamped twice with the seal of Geneva Quality Mark, rhodium-plated, fausses cotes decoration, 18 jewels, straight-line lever escapement, monometallic balance adjusted f or heat, cold, isochronism and 5 positions, shock absorber, self-compensating Breguet balance-spring, swan-neck micrometer regulator. Dial, case and movement signed. Diam. 32 mm. Thickness 11 mm. The present watch is distinguished by its marvelous condition. The case back is stamped with hallmarks, which are incredibly deep and crisp. The dial too, is equally beautiful, having developed a pleasing layer of patina over time. The enamel signature remains strong and raised. 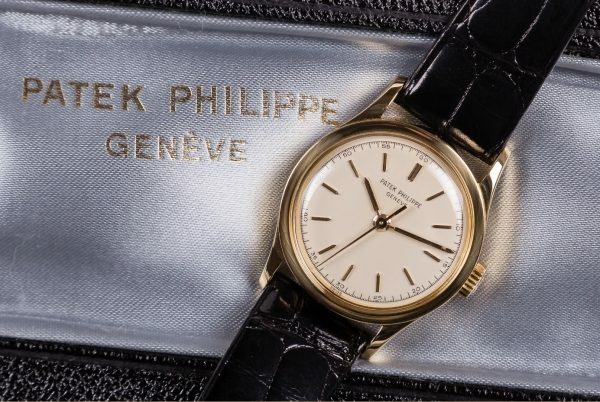 Patek Philippe reference 2555 is the waterproof Calatrava. Compared f.ex. to reference 96, which features a snap-on case back, reference 2555 is fitted with a screw down case back. This reference is highly rare. To date, no more than a dozen examples have appeared at world market, with the present watch being fresh to the market. First Patek Philippe Calatrava was reated in 1932, it is the result of an avant-garde philosophy of aesthetics that showcases sleek lines and subtle elegance; the collection expresses artistic ingenuity at its very finest. The endearing quality of the design reflects the relentless pursuit of perfection that has always been at the core of Patek Philippe’s mission. These inimitably elegant ladies’ and men’s watches are impervious to short-lived trends, recapturing the hearts of each new generation. Whether extra thin, with hobnail patterns or wide polished bezels, they are all unmistakable members of the Calatrava family and even their changing faces cannot belie their origins. No other watch lends better expression to the true Patek Philippe style.